Globalscope, the international network of independent advisors in the field of mergers and acquisitions, fund raising, and corporate finance extends its presence in Eastern Europe by accepting SORTIS Invest from Bulgaria in its family. The new partnership is expected to boost the development of the M&A market in Bulgaria. 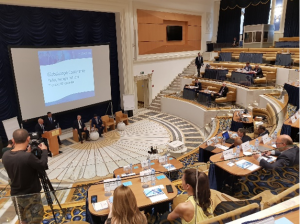 SORTIS Invest was welcomed to the network at an official ceremony held at the Globalscope autumn conference on September 16 in the old parliamentary hall of the Georgian Parliament in Tbilisi, Georgia. The event was attended by the partners of 34 network members from 27 countries. Representatives of SORTIS Invest at the event were Mr. Martin Paev, CFA, Founder and Executive Director of the company, and Mr. Dimcho Dimitrov, Investment Banking Director. Globalscope is an international network of independent M&A advisors, headquartered in London with 57 member companies from 48 countries around the world. The network was established in 1987 when a group of corporate finance consultants joined together to assist their clients in cross-border transactions. More than 600 highly qualified specialists in the field of M&A, fundraising, corporate finance, and business planning work in Globalscope’s companies. In 2017, the network has advised over 150 deals with total value of more than €3.85 Bn. Globalscope has industry teams specializing in consumer goods, finance, industry, healthcare, services, technology, media and telecommunications. SORTIS Invest is the investment banking arm of SORTIS Group that provides financial advisory services in the areas of M&A, corporate finance, private equity, venture and debt capital fundraising, operational consulting and restructuring. The firm was founded in 2007 by Mr. Martin Paev, CFA, who has over 18 years of experience in asset management and investment banking. Recently, the most significant transactions successfully executed by SORTIS Invest are the sale of TBI Rent, the operating leasing company of TBI Bank, and the management buyout of Cremio AD, a producer of vegetable cream and dairy products under the brands Cremio and My Day.